The GOG.com and Steam versions features video settings, remappable controls, and online multiplayer whereas the Humble Bundle version does not. For the Humble Bundle release, the ROM for the purchased game can be found within the installation folder; for the GOG.com release, Windows users can also find the ROM file within the macOS and Linux versions. 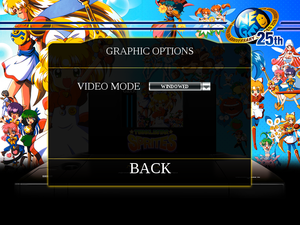 Copy the neogeo.zip and twinspri.zip files and paste them into another emulator's ROMs folder of your choice (See Emulation:Arcade). Video settings of the GOG.com and Steam versions. 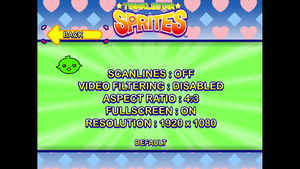 Humble Store version's video settings. The GOG.com and Steam versions supports widescreen resolutions, but the game is either 4:3 or stretched to 16:9. Can be toggled with Alt+↵ Enter with the GOG.com and Steam versions. True for the GOG.com and Steam versions by setting the game to your native resolution and fullscreen enabled. GOG.com and Steam versions has no V-sync. Gameplay is capped at 60 FPS despite showing the game running at 100+ FPS. Only in the GOG.com and Steam versions. Buttons are referred by their button number. Keyboard remapping from the GOG.com and Steam versions. Controller remapping from the GOG.com and Steam versions. Keyboard controls from the Humble Store version. Gamepad controls from the Humble Store version. Audio settings from the GOG.com and Steam versions. 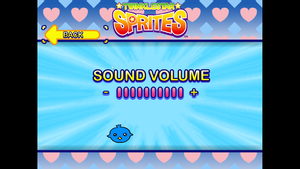 Audio settings from the Humble Store version. Language settings from the GOG.com and Steam versions. GOG.com and Steam versions pauses the game when out of focus. ↑ 1.0 1.1 File/folder structure within this directory reflects the path(s) listed for Windows and/or Steam game data (use Wine regedit to access Windows registry paths). Games with Steam Cloud support may store data in ~/.steam/steam/userdata/<user-id>/366280/ in addition to or instead of this directory. The app ID (366280) may differ in some cases. Treat backslashes as forward slashes. See the glossary page for details. I have taken the BIOs and ROM file from the Mac OS version of the game found under "<game>.app\Contents\Resources" folder and used them with RetroArch's Final Burn Alpha core and the game runs on the emulator. 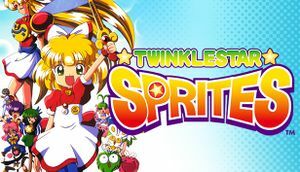 "We picked through a few of the sale's downloads to find ROM files that are compatible with the popular Multi Arcade Machine Emulator (MAME), meaning classic-gaming purists with dedicated MAME boxes now have a far more legal and frugal way to load classics like The Last Blade and King of the Monsters in their home arcade cabinets." This page was last edited on 14 April 2019, at 12:46.